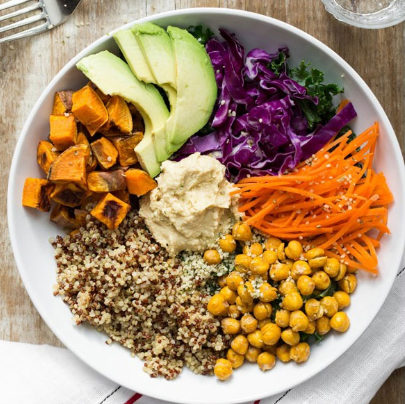 In our house, a staple meal is the trendy Buddha Bowl. It’s pretty safe to say that my husband and I eat one of these delicious healthy concoctions at least 2-3x a week. It’s so easy and you can get super creative – all you need is a carb, such as brown rice or quinoa, some veggies, some cheese if you prefer, and a protein. We experiment and get fancy with new ideas from Pinterest, such as making the Thai Peanut Buddha Bowl (rice noodles, satay chicken, lots of green onion, carrots and bean sprouts, and a touch of cilantro to finish – YUM!! ), or our staple favorite of Mexican, which involves a delicious combo of rice, black beans, corn, avocado, salsa and sour cream…and of course, my favorite…Cilantro! I will admit thought that we were having trouble coming up with creative ideas for protein for our Buddha bowls. We like chicken, we use lots of legumes, and once in a while we’ll add tofu. We’re not vegetarian by any means - maybe more of a pescatarian type that still eats poultry – but we don’t really enjoy red meat. Nevertheless, it can get boring with the same old thing. So it was very exciting when I received some delicious Yves vegan/vegetarian products to review – particularly the Falafel balls and the Kale and Quinoa bites. These both look like little meatballs, which excited me because my two kids LOVE meatballs, and I was certain I would be able to convince them that they would be delicious. They’re super easy to cook too – I spread them out on a baking sheet and baked them for 12 minutes on 400 degrees F.
I chopped them all in half, spread them over my Buddha Bowl, and dug in…to my delight, they were absolutely delicious. The falafel tasted garlicy, with lots of hints of cumin and coriander. I slathered my bowl with tzatziki and polished off half the bowl before I was nice and full. The kale and quinoa bites were just as good – moist and savory. I was pleasantly surprised. 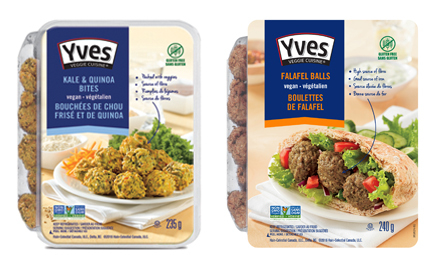 My children preferred the kale and quinoa to the falafel, but the fact that they ate them at all was quite an accomplishment, as they tend to be quite picky. Overall, these bites were a great success and I’d definitely buy them again. When I pulled them out of the oven, they looked a bit dried out. Even though they tasted great, I think I would try a different method of cooking next time – perhaps steaming them quickly and then pan frying them in olive oil to give them less of a dry texture. I can’t wait to try the Yves Veggie Ground Round - I’m going to make this delicious Sweet Potato Shepard’s Pie recipe with it!